KitFrame System - Electrical Cabinets, Cabinets Telecommunications, Air Conditioners and Heat Exchangers. KitFrame offers a differentiated, product of high quality standard for very competitive prices. The best industrial structure in Latin America for mass manufacturing of electrical enclosures. KitFrame's manufacturing structure is one of the factors that guarantees the world quality standards in its products. Located in the city of Cotia, in the metropolitan region of São Paulo, Brazil. The company has 150 direct employees distributed in a space of approximately 10,000 m². They attest to the superiority of KitFrame's products in relation to others available in the market. You can see each one of these certificates in this section. 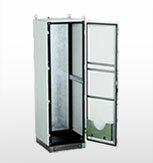 Learn more about our premium line of FSI indoor electrical enclosures. KitFrame offers a smart solution that enables several component mounting combinations with flexibility and safety. In addition to a great variety of standard products we offer, KitFrame also provides customized solutions by adjusting its products or developing new products in strict compliance with client's needs. Thinking of the client's needs, we developed the exclusive KitFrame Structural Assembly System.Electrical cabinets can therefore be mounted by the client.